Just an absolutely dominating performance, he absolutely obliterates the previous one day record. He got a few hundred dollars more than Michael Larson won in his Press Your Luck appearance. So did the audience practically. I was visiting with parents, siblings, in-laws, etc and went out for dinner on Tuesday. Tuesdays & Wednesdays are typical chill nights whereas Monday, Thursday, and Friday we'd go out to eat. If that routine had held, man! I would loved to have seen my family's reaction upon the airing of that episode! 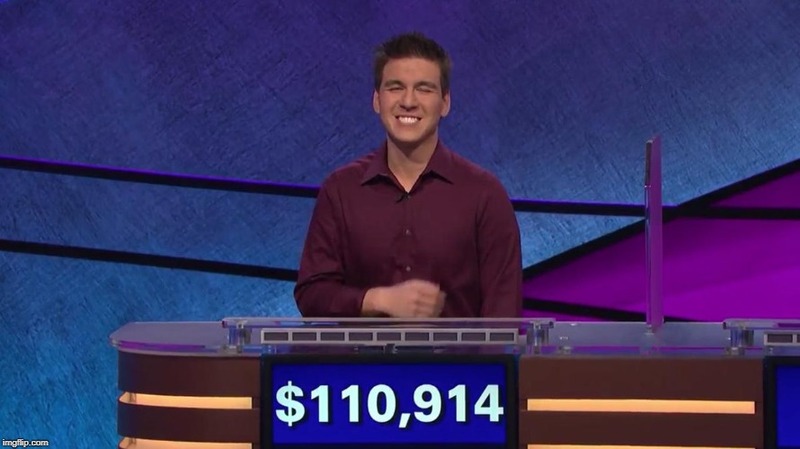 With him going into Final Jeopardy! with $72,600, and his closest opponent at $7,000, he could've risked up to $58,599 without endangering the lock game he had going (or $58,600, if he felt comfortable with the possibility of a tiebreaker). $72,600 + $58,599 = $131,199. Sure, but he was going for the symbolism. He also said in an interview with his hometown newspaper that he doesn't care how much money he actually makes on the show. His primary goals were to beat the one-day record and send shout-outs to friends and family. Way he's going he may well win a lot though for sure.....he's at as of tonight's/last night's airing, over $415,000 for his first 7 games. To put that in perspective, Ken Jennings for his first 7 only won $230,000 by comparison, so he ended up about $35,000 shy of doubling that. Pretty remarkable.